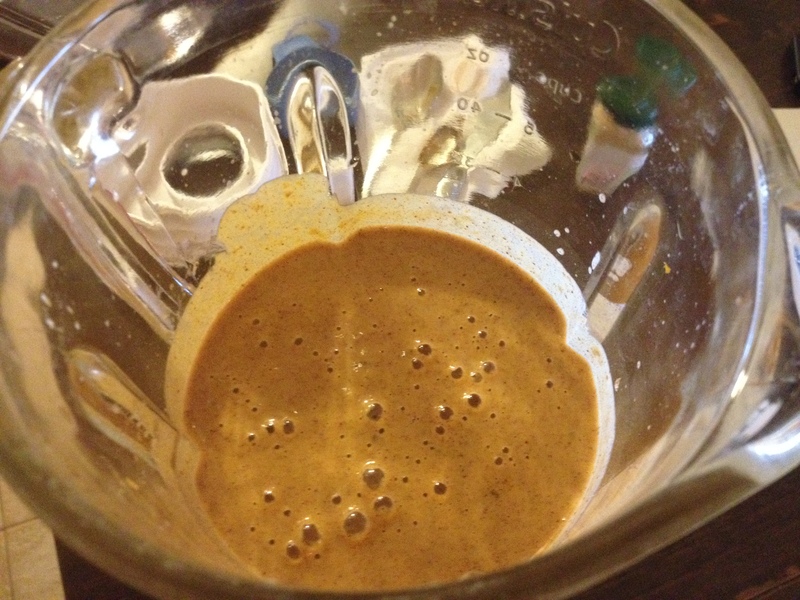 This recipe is adapted from this incredible version over at Health-Bent. They are a great resource for Paleo/Primal recipes. I was in Maine. These were hand-crafted with fresh, local, and in-season blueberries of tiny perfection. I was hiking. A lot. I was on vacation. Let’s just say the pancakes shared space on a delicious list of other treats enjoyed over the course of several days: blueberry pie, saltwater taffy, endless lobster rolls, beer… you get the idea. It wasn’t. In fact, it just left me craving pancakes. 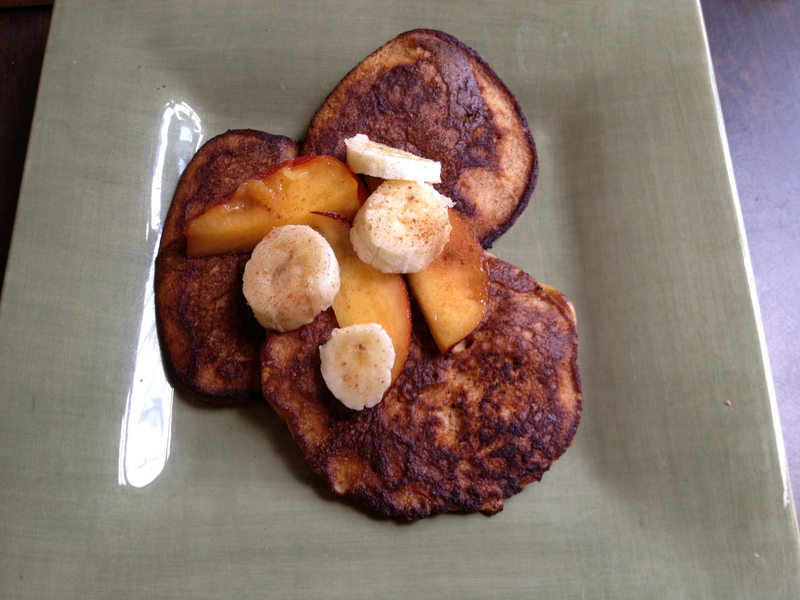 Interested in exploring the realm of pancakes sans flour, I came across Health-Bent’s amazing recipe. With a few tiny tweaks (and a lot of… ahem… practice), here’s my version, complete with lots of pictures to give you an idea of how awesome these turn out. Let’s get one thing straight. When I decide I want these pancakes, it’s usually either on a lazy Sunday morning over a cup of coffee when I’ve already decided I’m not working out that day OR on a last minute “let’s have breakfast for dinner” whim. Either way, I usually want to take the fastest route on the pancake highway to heaven. So, you’ve got to cook the sweet potato. Yes, you could bake it. Yes, you could peel it, chop it, and boil the pieces. Or, if you’re in instant gratification mode like me, you can rinse it, poke holes in the skin with your fork, and throw that pup in the microwave. Place on one side for 90 seconds, then carefully turn it over for another 90 seconds. If it’s particularly large or thick, you may need 2 minutes on one side. When the sweet potato is cooked (very soft), cut it open, splay it out, and allow it to cool. True story: I’ve been known to place it in front of a breezy window or a fan. I’ll also put it in the fridge after a minute or so for extra fast cooling. While waiting out the cooling process, crack your 3 eggs into a blender. Add in the almond butter, coconut milk, spices, and salt. Next, add in the sweet potato in a few pieces and then the baking soda and baking powder. Put the lid on that thing and blend it up! At this point, I recommend heating up your griddle or pan(s) on the stove with a bit of butter or coconut oil, as blending should take no time at all. You want the batter to be quite runny, not thick like other batters. If it’s too thick, pour in a bit more coconut milk little by little until you’ve got a nice liquid batter. Make sure you’ve got a good medium to medium-high heat going — if you’re using butter, watch for it to foam up a bit, but not burn. 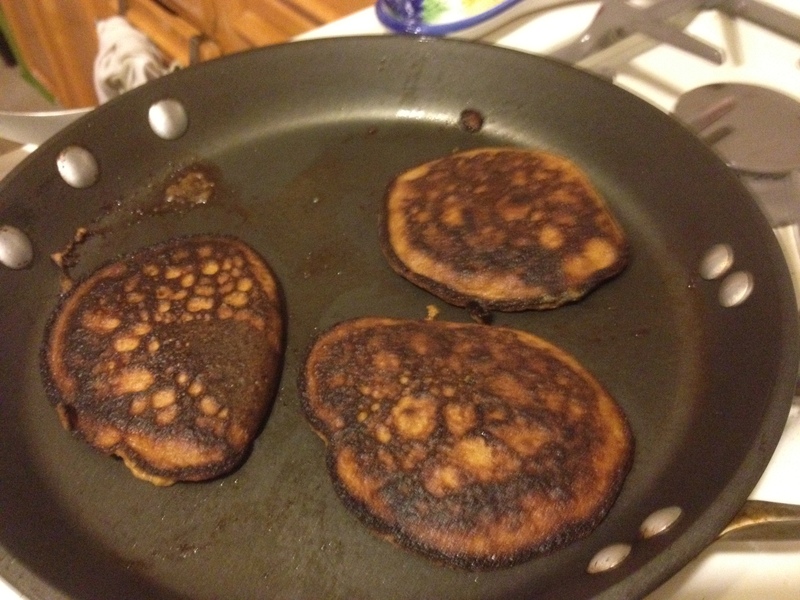 I use two non-stick pans at once so that I can cook three small pancakes in each, six total at one time. This way, hungry boyfriend and I can both eat three lil flapjacks with each serving. 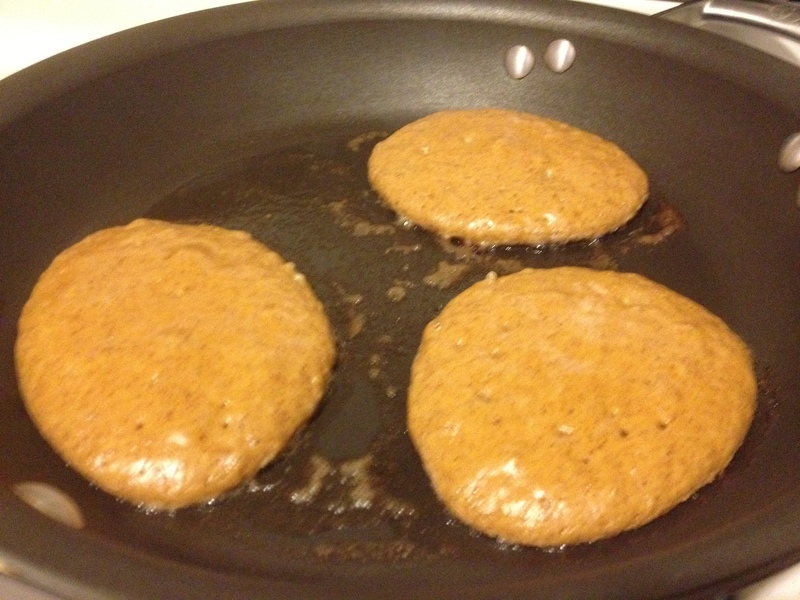 Pour in a small amount of batter, starting slow and allowing it to expand out to about 3-4 inches across. Then, add in your pecans, pressing them lightly into the pancakes. Sometimes I’ll do one out of every three without the nuts, just to switch it up. They are delicious no matter what. Watch your first batch well. You want to be at a high enough heat to get a bit of a crispy edge, but not so high that they really burn. Once there are small bubbles over a majority of each pancake, start flippin’! Cook the other side for another minute or so (depending on your heat). Serve up your first batch and top with any sliced fruit, extra nuts, chocolate-hazelnut butter (What?! Who said that? ), maple syrup, or other additions. I like to pour my next batch before I sit down to the first trio. 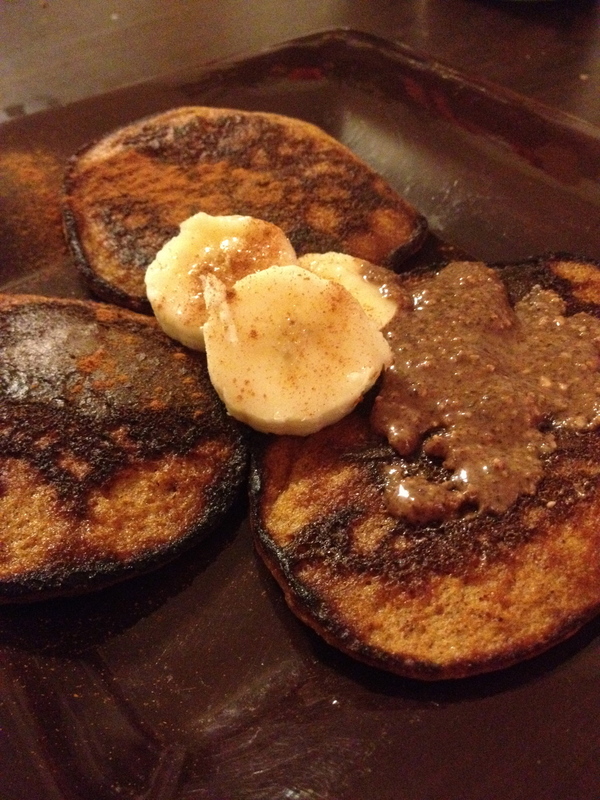 This creates a constant, flowing river of paleo pancakes for at least the next 15-20 minutes. Mmmmmm.